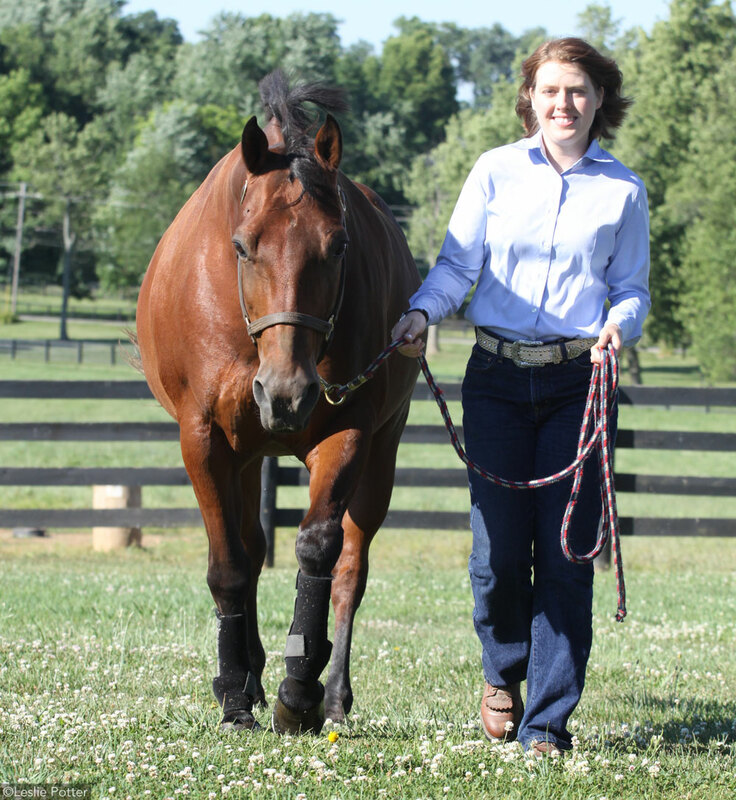 Fix these three simple handling errors that erode your horse’s respect for you. You teach your horse how much to respect you and your space each time you lead him. While you may mindlessly grab a halter and casually walk your horse to his next destination, he pays attention to which behaviors you allow or correct. He notices when he can get his way and take charge. These complaints come when horse handlers overlook common leading mistakes. They don’t defend their personal space, they allow their horse to choose the destination, or they don’t correct the painfully slow walk. I’ll help you get your horse’s attention, so you can maintain your personal space and teach your horse to lead with perfect manners. If your horse is pulling, pushing, or lagging behind, it’s time to change how you lead him—and what behaviors you allow. I want my horse to walk willingly beside me and know that he must pay attention to my speed and direction. When I lead my horse, I have a reason to get to a new destination. I want him to keep up without dragging me, bumping me or getting too far behind. To correct any of these common mistakes, outfit your horse in a rope halter and a lead that is at least 12 feet long. Have a training stick with a flag on hand to help you reinforce your new cues. Why it’s a Problem: It’s dangerous to allow your horse to walk into your space or lean his shoulder into you. Your horse should pay attention to your movements and know where to stay. I like my horse to walk so that my right shoulder is just in front of his left eye. He should walk beside me without being close enough to bump into me. In this position, he can see where I’m moving and when I stop. Most horses will obey the rules you set about where to be. However, they must first know where to be and what the rules are. Your horse should only move his feet when you request it, he should keep his nose in front of his chest, he must move in the direction and speed you ask at the time you request it, and he should keep doing whatever you asked him to do until you provide a new cue. He should have deference for your space and be willing to step away quickly if he gets too close. The Fix: First, check how you’re holding the leadrope. If you’re holding tightly just under your horse’s chin, you may be pulling him into your space. You can’t teach him to maintain his own position if you’re pulling on him. Instead, hold your right hand about a foot and a half from the halter knot and keep both of your hands up and in front of you. Practice leading your horse with your new hand and body position. With your hands forward, your horse will learn to follow your hands. He’ll have a visual cue to know where you’re going. When he stays behind your hand, he’ll have ample time to change gaits, direction and speed by watching how you move. 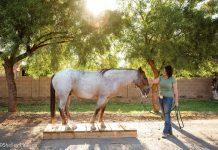 Ask your horse to move forward by leaning forward with your upper body, then moving your feet; your hands will lead the way. Ask your horse to stop by leaning back, then stopping your feet. Your hands will raise up and signal your horse to stop. He will learn to focus on your body movement for cues and be rewarded with a loose lead line when he stays in position. If your horse is getting too close to you, practice turning him away. Each time you turn him to the right (away from your leading position), you move him out of your space. The dominant horse in a herd always commands space and the subordinate horses move away. Each time you practice turning your horse away, you remind him that you’re in charge. To turn to the right, turn your feet toward your horse and raise your hands to apply mental pressure just behind your horse’s eye. While you shouldn’t need to touch your horse, he should move away as you move toward him. If he still doesn’t turn away, you may need to carry a flag to help defend your personal space. Turn your feet toward your horse and raise the handle end of the flag as you hold it in your right hand. The flag will brush the ground and cue the horse to move his feet away while you also teach your horse to respect your hand cues. Holding the flag extends your arm and provides a way for you to defend your personal space. Lead your horse forward, then ask him to turn away from you again. Any time you lead your horse, you can practice turning away and reinforce your authority. Why it’s a Problem: Grabbing an extra snack means that your horse isn’t paying attention to where you’re going. Instead, he’s focused on what he wants. If you’re with your horse, it’s time to move and he should be focused on you, not the vegetation. Grabbing grass means that your horse is choosing the destination and you can’t get where you want to go. Plus, in a herd, the horse that controls the food is dominant. If your horse pulls away to eat when you’re present, it’s a sign that he is in control and has little deference for you. The Fix: Make sure your horse knows the rules. It’s possible that he’s been allowed to graze (or take one final bite) after he’s haltered. If he’s otherwise calm and respectful, he may simply need a reminder that he’s not to eat once you’re ready to walk on. Given the opportunity, even the sweetest, best-trained horse would choose to eat instead of work. But if you halter your horse and ask him to move forward, he should stay with you and look where you’re going. Lead with your hands up in front of you, just as you did to claim your space in the first exercise. If your horse stops to grab for food, bump the lead rope and use your voice to correct him. Yell, hiss or make whatever noise is needed to get his attention. If you merely pull on the rope and he pulls again, you didn’t apply enough pressure to motivate change. Simply pulling again will only wear out your muscles and you’ll start a tug-of-war match with your horse. Elevate your pressure until your horse realizes he must snap-to and listen to your request. Sometimes you want or need to allow your horse to graze while you’re with him. If you want your horse to eat, make sure that you have a clear cue to differentiate leading time and hand grazing time. The horse must clearly understand that you are giving him permission to eat. You may extend the lead line so that it lays on the ground, then give your horse a verbal cue, such as “OK.” When it’s time to walk back to the barn, pick up the lead and ask your horse to move forward. Once you’re in leading position and walking with a purpose, he shouldn’t reach down to grab one last snack. If he does, correct him by pulling up quickly on the lead and give him a verbal admonishment. Why it’s a Problem: If your horse lags too far behind, he may switch leading sides and wrap you in the rope. Plus, lagging behind shows that he isn’t attentive to your speed and is doing what he wants. It’s a sign of quiet defiance: you want him to move and he has a way to tell you that’s really not what he’d like to do. The Fix: First, make sure to give a clear cue that you intend to move forward and faster. Move your shoulders and hands forward first as you ask your horse to move forward. This visual cue will help your horse see that a speed change is coming. After you move your shoulders, speed up your feet. Your hand stays up and because your body moves forward, the lead will move, too. If the horse doesn’t speed up as you want, he’ll feel a pull on the rope halter. The pressure on his halter should move him forward. If you want to trot, pick up a jog yourself. Keep looking where you want to go and allow the leadrope to tighten until your horse responds. When he picks up speed, allow slack in the line to praise him—but keep moving. If your horse doesn’t speed up with your body cue and the tug on the halter, add some mental pressure. Have a buddy shake the flag behind you to reinforce your cue to move. 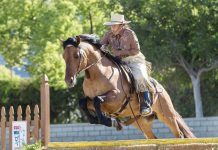 As soon as the horse speeds up and stays at your pace, make sure that your leadrope is loose and your friend stops flagging. He’ll be rewarded by the release of the lead pressure (and the release from the mental pressure of the flag) and learn what’s expected. If your horse is having trouble with several of these leading issues, focus on fixing one at a time. Once your horse understands one new rule, move on to work on the next. Don’t suddenly transition from allowing everything to suddenly correcting every step and change of focus. Work first on maintaining your leadership; change your body posture and your mindset. Have determination and purpose each time you lead your horse. If you look determined and confident, your horse will know he should follow well.